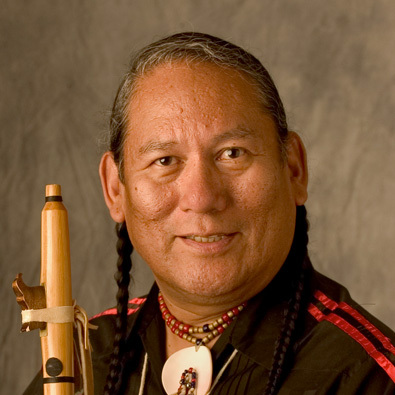 Born in Arizona in 1946 of Navajo-Ute heritage, R. Carlos Nakai is the world’s premier performer of the Native American Flute. He began his musical studies on the trumpet, but a car accident ruined his embouchure. His life took a turn when he was given a traditional cedar flute as a gift and challenged to master it. And master it he has. Since the early 1980’s he has sold more than 4.3 million albums, earned two gold records and received 11 Grammy nominations in 4 different categories. Mr. Nakai is also an iconoclastic traditionalist who views his cultural heritage not only as a source and inspiration, but also a dynamic continuum of natural change, growth, and adaptation subject to the artist’s expressive needs. He says that most of his inspiration comes from the expressions of native communities and his desire to preserve his own Native American heritage. His career has been shaped by a desire to communicate a sense of Indigenous culture and society that transcends the common stereotypes presented in mass media. R. Carlos Nakai is a Native American flutist of Navajo/Ute heritage. He released his first album, Changes, in 1983 and since then his work has been universally appreciated. Part of Nakai’s philosophy is to ensure that the native flute does not become a “museum piece” of a bygone culture. Through his original compositions and other musical collaborations, Nakai intends to show the instrument’s versatility and capabilities. Nakai’s first album was released in 1983, and since then he has released over thirty-six albums with Canyon plus additional albums and guest appearances on other labels. In addition to his educational workshops and residencies, Nakai has appeared as a soloist throughout the United States, Europe, and Japan, and worked with GRAMMY winning flutist Paul Horn, guitarist/luthier William Eaton, composer James DeMars, two-time GRAMMY winning producer Billy Williams, among others. The famed American choreographer Martha Graham used Nakai’s second album, Cycles, in her last work, Night Chant. Nakai contributed music to the major motion pictures New World (New Line) and Geronimo (Columbia). Nakai, while cognizant of the traditional use of the flute as a solo instrument, began finding new settings for it, especially in the genres of jazz and classical. He founded the ethnic jazz ensemble, the R. Carlos Nakai Quartet, to explore the intersection of ethnic and jazz idioms. Nakai brought the flute into the concert hall, performing with over fifteen symphony and chamber orchestras. He was a featured soloist on the Philip Glass composition, Piano Concert No. 2: After Lewis & Clark, premiered by the Omaha Symphony, and a lead soloist, along with tenor Robert Breault and mezzo-soprano, Isola Jones, in the premiere of Guadalupe, Our Lady of the Roses, an opera by James DeMars. Nakai has also sought opportunities for cross-cultural collaborations. He performed extensively with the Wind Travelin’ Band, a traditional Japanese ensemble from Kyoto which resulted in an album, Island of Bows. Additional recordings with ethnic artists include In a Distant Place with Tibetan flutist and chanter Nawang Khechog, and Our Beloved Land with famed Hawaiian slack key guitarist and singer Keola Beamer. Recently, Nakai released Voyagers with Philadelphia Orchestra cellist Udi Bar-David that blends Native American melodies with Jewish and Arabic songs. A Navy veteran, Nakai earned a Master’s Degree in American Indian Studies from the University of Arizona. He was awarded the Arizona Governor’s Arts Award in 1992, and an honorary doctorate from Northern Arizona University in 1994. In 2005 Nakai was inducted into the Arizona Music & Entertainment Hall of Fame. Nakai has also authored a book, The Art of the Native American Flute, a guide to performing the traditional cedar flute.